Real Talk: More than meets the eye? For example, I argue that the life of Peter Parker (a.k.a. Spiderman) somewhat mirrors the Christian Walk. 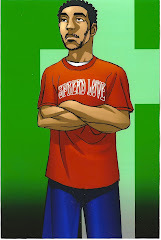 Once he received his powers, he struggled with whether or not to use his powers for self-ish reasons or to help others. Similarly, as Christians God has entrusted us with wisdom, discenrment, and spiritual authority over Satan, but it's up to us to decide whether we are going to use what God has blessed us with to bless others. It may sound Cliche-ish, but it's on that "to whom much is given, much is required" steez. On more of a social level, the X-men are a group of mutants who've dedicated their lives to working towards unity between humans and mutants. I believe that the X-men's decision to protect those who fear and hate them (i.e. humans) and their strivings for unity resemble the civil rights movement and the ills of racisim. This idea of racism and societal outcasts was made more clear to me while learning about the plight of a group of mutants known as the Morlocks in an episode of X-men. Like the X-men, they are feared and hated by humans. Unlike the X-men, however, their mutant characteristics are more visible (i.e. they have more physcial and facial deformities), therefore they cannot "pass" as human. As a result, they live underground, and have to steal food to survive. This dynamic of having one group of mutants who are more marginalized in society than another group relates to past and contemporary divisions bewteen people with darker skin and those with lighter-skin, and how "light-skin" black and brown people appear more acceptible in mainstream American media. In terms of superheroes' political relevance, the Black Panther's name should speak for itself. The Black Panther is the first prominent Black superhero. He lives in an African nation that was unaffected by European colonization. He protects his nation from colonization and other countries' attempts to exploit his nation's resources. Sound familiar? He first appeared in issue #52 of the Fantastic Four in 1966, the same year that the Black Panther Party for Self-Defense was formed in Oakland, Ca by Bobby Seale and Huey Newton. Coincidence? Hardly. It doesn't take deep analysis to see there's a connection. In a recent Black Panther comic (part of a four-part crossover series with the X-men), the Black Panther addresses the issue of the death penalty in Texas. Such a comment would not have been necessary if he was simply an action-packed character, suggesting that there's more to many superheroes than what meets the eye. Having no previous interest in superhero genre I am somewhat moved by your perceptions as to the underlying message behind these fictional stories. I would have never paralled the significances to contemporary issues still plaguing society today. Overall excellent article. Holy Hip-Hop resources section added!!! Back like I left something!